You don’t need more fans or followers. Buying followers is even worse. If you’re looking for new fans to buy your music, or more followers to fill your feed. Stop. True fans are long-term customers who are ambassadors of your brand. Let’s call these brand ambassadors, superfans. They bring their friends along to your shows, tweet 15x’s about your new album, the lyrics, the beat, who it reminded them of, etc. They buy your merch at shows, and even if they’re older than 18, they wish they could have a poster of you hanging on their bedroom wall. Yea, all of that. Why isn’t that kind of fan, what most music creators are looking for? If you concern yourself with chasing the next fan or follower (who has no clue about you, or your music) how are you making your superfans feel? New fans are new money in your pocket, today. But, super fans are money in your pocket for life. 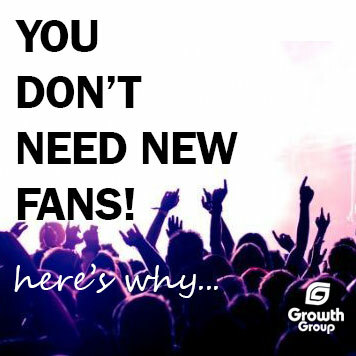 Your time and talent should be devoted to expanding your current fans’ experience with you. They’ll most likely bring the new fans with them, even without you asking. What can you give to your superfan that is exclusive? What about a CD signing event at an exclusive location that is only sent to fans on your mailing list when you’re in their city? Can you direct message superfans your location via twitter if they tweet their copy of your CD (or digital download) and ticket to your concert (or confirmation e-mail) tour stop in their city. Give them access to you, it’s what they want. Could you allow your superfan to bring 1 friend with them to the pre-show CD signing (they’re happy, and maybe you get a new fan)? If you do, tell me that this superfan won’t be ready to sing your praises and show off pictures from that exclusive event, and tell everyone they know. What are you doing to embrace and woo your current fans?